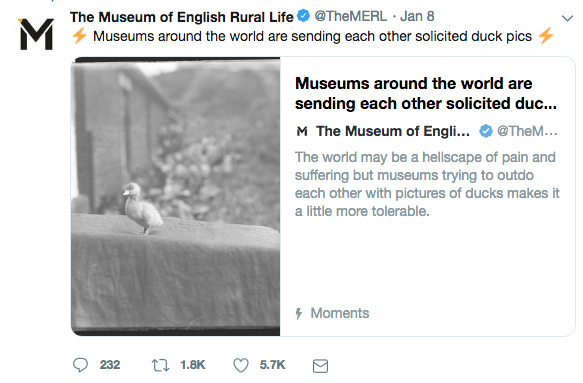 The Museum of English Rural Life was given the surprising gift of going viral off the back of a single tweet in April of last year. Previously the small university museum languished with niche content that appealed, in the main, to people already affiliated with the university and the Reading community more broadly. 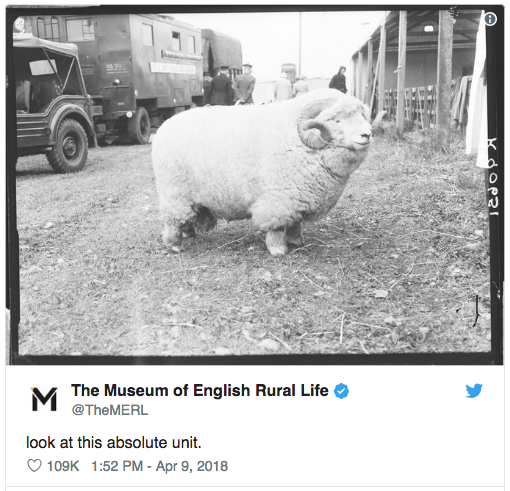 When they jumped on the meme train with the now-infamous ‘absolute unit’ tweet, their followership exploded overnight—and so it was time for a shift in content. Broadly speaking, they’ve done a great job of balancing hilarity (see the image below!) with education, showing their followers that museums don’t have to be dry, stuffy establishments. And yes, it’s true that the international nature of their 100,000-strong follower base means a huge majority of their followers will never set foot in the museum, but at the end of the day, those followers are still learning about esoteric, interesting, fun and unique objects held in the museum’s collection, and what more could a non-profit educational organisation want? Activist organisation Greenpeace has a tall order: inform their readers of the myriad environmental problems facing the world without burning them out or leaving them feeling hopeless in the face of negative news. To do this, they use Twitter to post articles with bite-sized excerpts telling their readers how they can help. This strategy alone would be tiresome, so they alternate these posts with others that celebrate environmental wins from around the world, so the fight against climate change, pollution & other issues doesn’t seem impossible. Most importantly, the overall tone of the account is hopeful and instructive, not hopeless. Their ability to seamlessly move between big picture items (things like economic inequality) and smaller items (celebrating a pair of gay penguins) keeps followers engaged, informed and, most importantly, ready to ‘do their bit’. Hootsuite is a social media tool that helps users better manage their social media output. As with any technology, its content could run toward the dry or arcane, but their main account provides useful content to their audience in a format that allows for users to know exactly what they’re clicking on before they do so: no clickbait here, folks! Even more impressive is their ‘Help’ account. 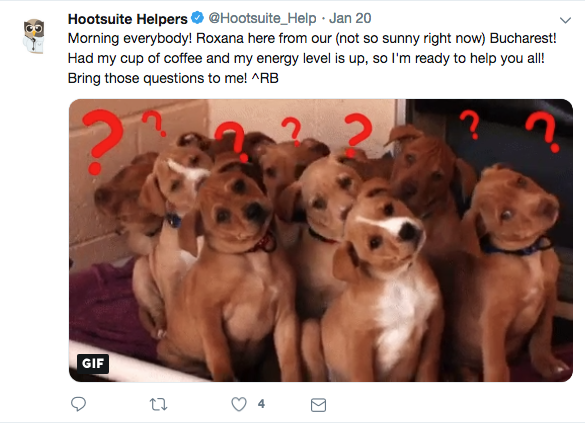 No one enjoys dealing with customer support accounts online, but Hootsuite takes the sting out of what can be a frustrating experience by humanising the people on the other side of the computer screen. Each day a new person tweets from their account with their name, location and a fun picture or gif to let users know who they’ll be interacting with if they have a problem. Research shows that people are more likely to be rude, hostile or aggressive when they have perceived anonymity online, so Hootsuite’s method of identifying the name and location of their help staff makes the experience that much more likely to be smooth for all involved. What’s a MoonPie, you ask? A MoonPie is a fairly obscure snack originating in the American South comprising two soft round biscuits filled with marshmallow and covered in chocolate, similar to a Wagon Wheel. Their heyday was way back in 1950s, but despite their relative obscurity, they’ve amassed nearly 300K Twitter followers (significantly more than most of their competitors). A quirky, nonsensical tone combined with a nimble and quick response time is the key to their online success. While many of their tweets are about MoonPies in some form, a large proportion are also just tweets about the moon—and none take a serious tone. MoonPie eschews typical brand strategies: most brands follow the ‘don’t engage the haters’ mentality but MoonPie happily retweets complaints about their brand with cheeky replies. And although most brands opt for subtle, soft-sell messaging, when MoonPie does ask you to buy their product, they do so in the most over-the-top way that would be obnoxious coming from any other brand. But from MoonPie it’s impossible not to love it: their tweets rack up thousands of retweets and favourites from engaged users the world over. MoonPie’s timeliness in jumping on the bandwagon of whatever meme is making the internet rounds is also exceptional—take a look at their handle below, which they changed for the Super Blood Wolf Moon that took place last week. Their style is definitely not a fit for all brands; no one wants the NHS to post the kind of thing MoonPie does, for example. But their account is a good reminder that standing out from the crowd on a competitive platform like Twitter can pay dividends in followers and earned media. KFC’s US Twitter account is a pretty typical fast-food restaurant account comprising mainly tweets about new products & deals, but they also hold my own personal favourite Twitter in-joke, which catapulted them to the centre of the Twitterverse when it came to light back in 2017: their account follows only 11 others. Who are they? The five Spice Girls and six random guys named Herb. 11 Herbs & Spices. Brilliant! Your brand doesn’t have to do it all on Twitter, but it’s important that you pick a voice, a style & a tone and cultivate it. 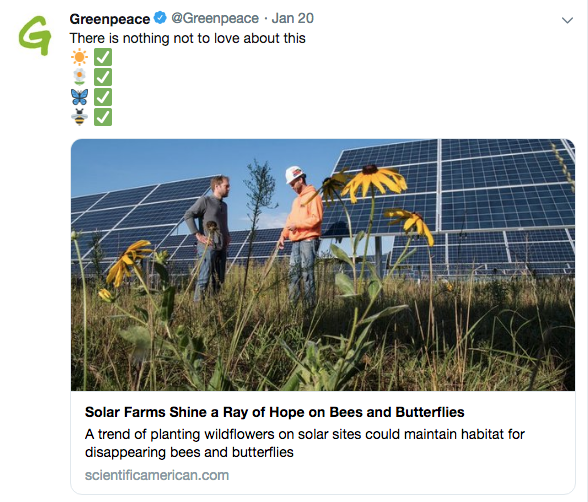 While it wouldn’t make sense for Greenpeace to suddenly start tweeting in the style of MoonPie, both brands have mastered unique ways to engage and reach their target audiences. Not sure what your brand’s voice is? Elastic can help. A brand workshop with us will help you identify your brand’s personality and show you how to demonstrate it to the world. Ready to dive into the world of social media but need some help getting off the ground? We do that, too! Contact us today to find out how we can help your brand achieve more, online and off.